Utah offers great alpine skiing, so why not also eat the way they do in the Alps? 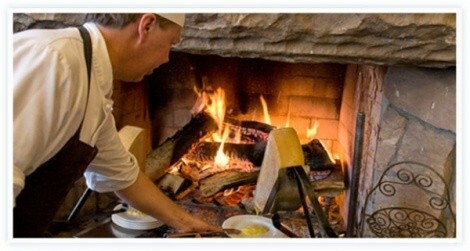 The traditional way of cooking food over a roaring indoor fire is featured at Fireside Dining at Empire Canyon Lodge. Four different courses are found at various stone fireplaces as guests make their way through a unique evening of dining. Although the lodge is operated by Deer Valley, it’s located in the Empire pass, and just getting to it provides a beautiful drive through one of Park City’s less-traveled canyons. The night begins with large blocks of Swiss raclette cheese sitting next to the flames and melting right onto plates, which are then handed to the diner, who can combine them with bread, cured meats, homemade chutneys and unique mustards to make an array of delicious appetizers. The second course is a series of simmering stews and fricassees, featuring everything from veal to rabbit to venison to quail, all served with a potato rosti to go along with salad and housemade ciabatta bread. Legs of lamb hang in front of the fire and are cooked right before your eyes for the third course. The freshly carved lamb is served along with Dutch-oven dishes such as Vidalia-onion bread pudding. Finally, dessert consists of fondues of chocolate, caramel and white chocolate Grand Marnier being warmed by the blaze to be accompanied by fruits, cakes and cookies for dipping. You can also enjoy a snow-capped winter night by scheduling a horse-pulled sleigh ride around the grounds before, after or in between courses of your meal. Being under starry skies in the mountains, after just having eaten next to a fireplace, makes for a classic winter experience.